Ear canal blockage can occur to anybody at any time and can be caused by a variety of reasons. The shape and size of the ear canal differs from person to person though is usually around 2 to 3 centimetres in length. It serves as a connecting tube that runs between the outer ear to the middle ear. Causes Of Ear Canal Blockage. The most common reason for a blockage to occur in the ear canal is due to a build-up of excess wax. Earwax is a natural substance found in the ears of all people and serves to protect the middle and inner ear structures from germs, fluids and objects. Occasionally, for a variety of reasons, this substance can either be over produced or not be effectively excreted from the ears and cause a build-up to occur resulting in either partial or total blockage. Small children are commonly known for their ability to lose small parts of toys or general household items in their mouth, nose or ears. This is usually quite harmless and the item will often find its own way out of the ear. If however it still has not come out after 24 hours, or if there is bleeding, swelling or large amounts of pain experienced, medical help should be sought. Do not ever attempt to extract the item yourself as this will normally cause the object to be pushed deeper into the ear causing much more serious damage. 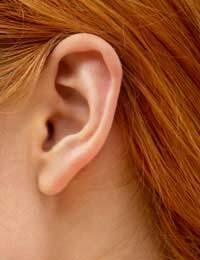 Occasionally ears can become blocked following a head cold or illness. This is often due to an infection and will quite often need treating with medication. If the person has a high fever, bleeding, discharge or has been suffering from vomiting, advice from your GP should be sought. Signs and Symptoms of Ear Canal Blockage. The most common sign of ear canal blockage is to suffer from some degree of hearing loss. This may be minor, or fairly noticeable if total blockage has occurred.Foreign bodies or infections of the ear can cause either earache or often quite a lot of pain along with a discharge from the ear and sometimes bleeding.Any degree of blockage can cause interruptions with normal ability to balance and dizziness commonly coincides with this. Treatments For Ear Canal Blockage. If excess wax is thought to be the cause, try using a few drops of warm olive or almond oil to help soften the wax and lubricate the passage of exit. If a foreign body is the cause of blockage, do not try and attempt to remove it, always seek medical advice if the item still hasn’t worked its own way out after 24 hours. Ear infections, if minor, will quite often clear up on their own, thanks to the body’s natural immune system processes; if symptoms persist or worsen however, seek medical advice as anti-biotics may be needed. Ear canal blockage is a fairly common disorder and can be due to a number of different causes. If symptoms persist or get worse, always see your GP, who will be able to either give advice, treatment or refer to an ear health specialist.